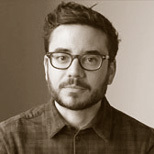 Simon King is a Design Director at IDEO where he helps organizations launch products and services that make the world more responsive, connected, and humane. He holds a BFA in Graphic Design from Western Michigan and an MDes in Interaction Design from Carnegie Mellon. He advocates for hybrid designers that span traditional disciplines in his book Understanding Industrial Design: Principles for UX and Interaction Design, published on O’Reilly. He’s easily excited by new ways of prototyping, elegant data design, thoughtful storytelling, and nerdy debates. In this webcast Simon King will share techniques for designers to reflect on that conversation and prototyping tools to help simplify it.